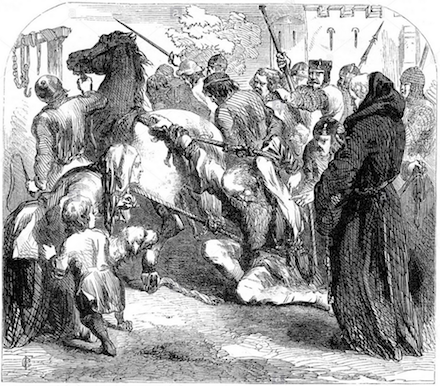 On this date in 1196, William FitzOsbert was torn from church sanctuary and hanged for one of medieval London’s most famous rebellions. At length, by his secret labors and poisoned whispers, he revealed, in its blackest colors to the common people, the insolence of the rich men and nobles by whom they were unworthily treated; for he inflamed the needy and moderately wealthy with a desire for unbounded liberty and happiness, and allured the many, and held them fascinated, as it were, by certain delusions, so closely bound to his cause, that they depended in all things upon his will, and were prepared unhesitatingly to obey him as their director in all things whatsoever he should command. this man, bent upon his object, and surrounded by his rabble, pompously held on his way, convoking public meetings by his own authority, in which he arrogantly proclaimed himself the king or savior of the poor, and in lofty phrase thundered out his intention of speedily curbing the perfidy of the traitors. The extent to which this man had by his daring and mighty projects attached the minds of the wicked to himself, and how straitly he had bound the people to his interests as the pious and watchful champion of their cause, appeared even after his demise. For whereas they should have wiped out the disgrace of the conspiracy by the legal punishment of the conspirator, whom they stigmatized as impious and approved of his condemners, they sought by art to obtain for him the name and glory of a martyr. It is reported that a certain priest, his relative, had laid the chain by which be had been bound upon the person of one sick of a fever, and feigned with impudent vanity that a cure was the immediate result. This being spread abroad, the witless multitude believed that the man who had deservedly suffered had in reality died for the cause of justice and piety, and began to reverence him as a martyr: the gibbet upon which he had been hung was furtively removed by night from the place of punishment, in order that it might be honored in secret while the earth beneath it, as if consecrated by the blood of the executed man, was scraped away in handfuls by these infatuated creatures, as something consecrated to healing purposes, to the extent of a tolerably large ditch. And now the fame of this being circulated far and wide, large bands of fools, “whose number,” says Solomon, “is infinite,” and curious persons flocked to the place, to whom, doubtless, were added those who had come up out of the various provinces of England on their own proper business to London. The idiot rabble, therefore, kept constant watch and ward over the spot; and the more honor they paid to the dead man, so much the greater crime did they impute to him by whom he had been put to death. Hubert Walter was eventually obliged to set guards at this shrine to chase away its pilgrims and forcibly suppress the emerging cult.